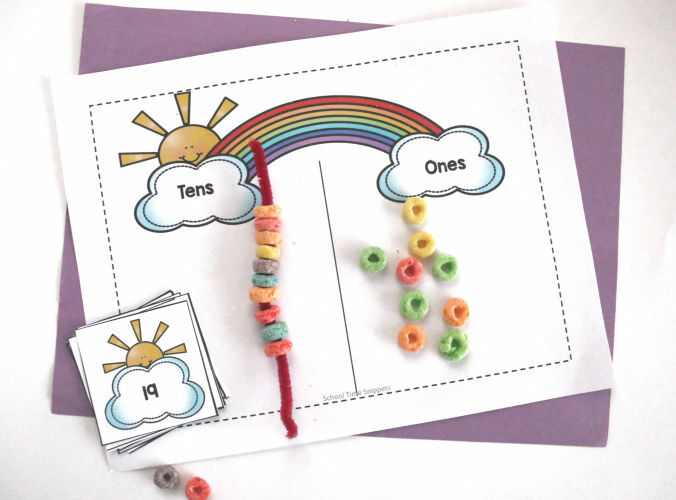 Try this FUN, hands-on rainbow maths place value activity teaching tens and ones to Kindergartners and/or 1st graders. 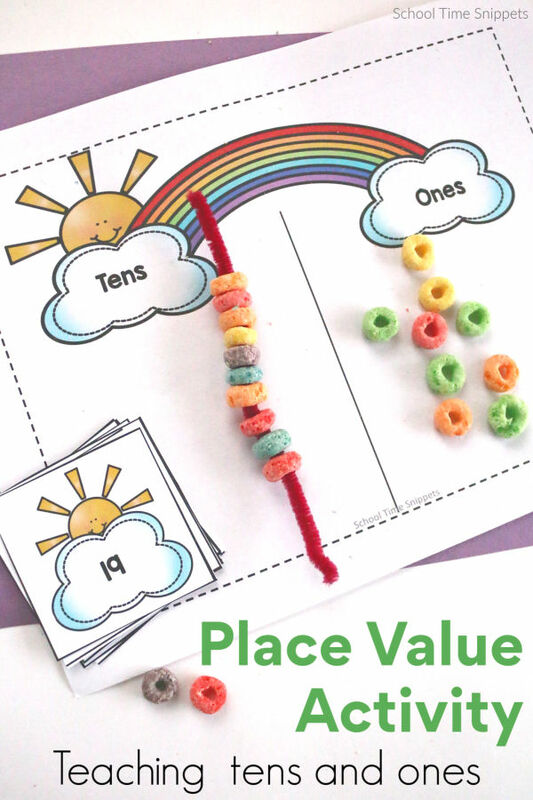 This colorful and tasty place value activity is sure to be a hit! 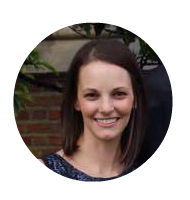 Teaching place value can be a tricky concept; thus why hands-on manipulatives are key to helping young learners visualize what each numeral represents. Touching and manipulating objects is especially helpful for visual and tactile learners. Not to mention the addition of a tasty treat for Base 10 blocks will be much appreciated for those that love to eat while learning... or those who just love to eat! To keep in tune to our rainbow theme, we used the ALDI brand fruit loop cereal. You could use name brand or even cherrios, but I LOVE LOVE LOVE the ALDI cereal! Seriously though, it taste wayyyyyy better than another well-known brand out there and doesn't have crazy ingredients like red dye. OR! if you'd rather forgo the food route, you can use beads! Teaching place value begins with understanding that numbers are orderly; each number has its own place. Begin counting numbers 0-9, placing a new piece of cereal in the "ones" column as you count. Reinforce that only *1* numeral can be in that spot! Now, when you get to 10 there are now two numerals.... so what do we do?! We make a new column: the "tens" place! 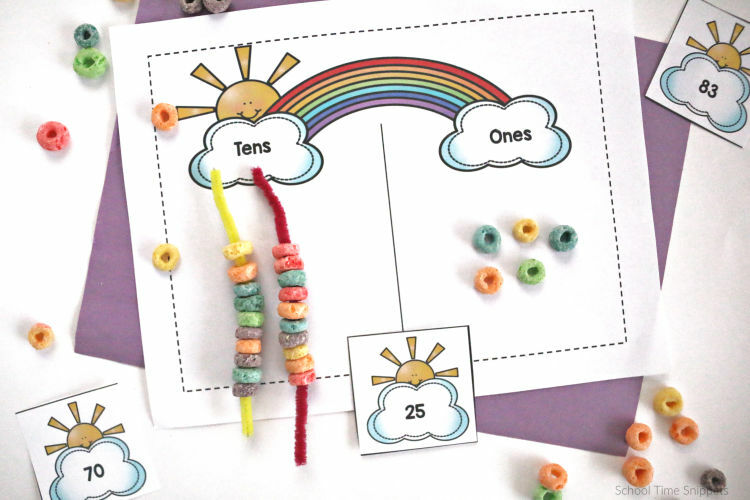 Show your child how to string the nine cereal pieces onto a pipecleaner and add one more to make 10. You now have a ten "block." Place your new ten block in the "tens" column. Then continue counting, adding a new cereal piece to the ones column, until you get to 20. The numeral 20 has 2 tens, so now another pipecleaner of 10 needs to be added to the tens column. If your child is still new to place value, it may be helpful to write out the numbers as you count. Continue making bars of 10 with cereal until your child shows understanding of the concept. 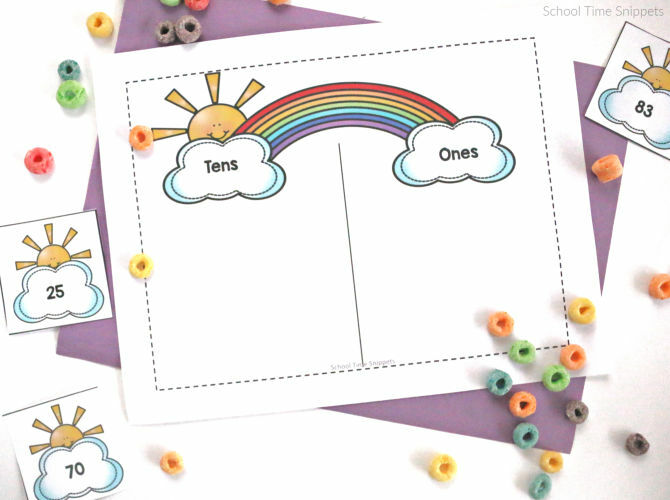 To use this rainbow maths activity more than once or with multiple children, it may be helpful to laminate and/or place the place value board in a sheet protector, as well as laminate the number cards included in this printable. Totally optional though! Included in the printable are 12 number cards to help reinforce teaching tens and ones. Once your child has gotten the hang of how to count using the cereal, have him/her pick a number card and build the number with their cereal base 10 blocks! Learn and snack at the same time!! Can math get any better than this?! Enjoy this fun, hands-on rainbow maths activity!! This activity was inspired by The Measured Mom's Free Place Value Activity. Learning about birds? Have a kiddo obsessed with peacocks?! 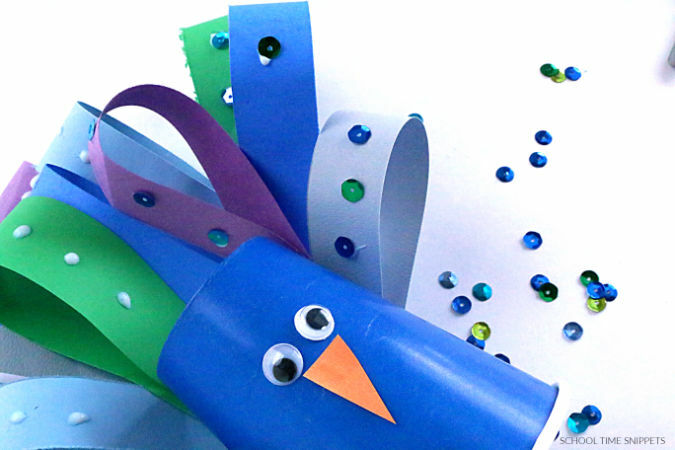 Then you might enjoy this stunningly simple Peacock Paper Cup Art and Craft! 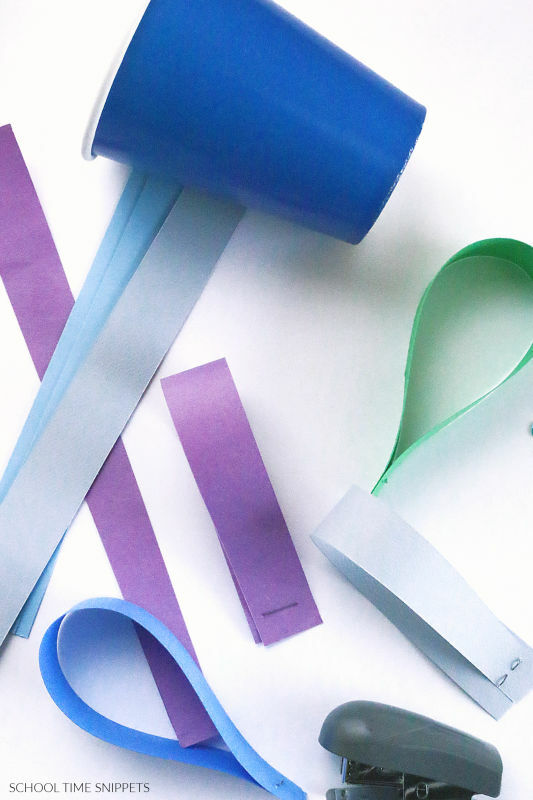 Kiddos of all ages will be able to help create this fun paper cup craft using many materials you may already have around the house! Truth be told, I love love love checking out the peacocks during a trip to the zoo. Their feathers are absolutely beautiful! I think my daughter is a fan, too. For the past several years the first thing she claims she wants to dress up as for Halloween is.... a peacock-- although, that still has yet to happen. Something else always comes to mind! Nevertheless, if you can't dress up as one (or won't! 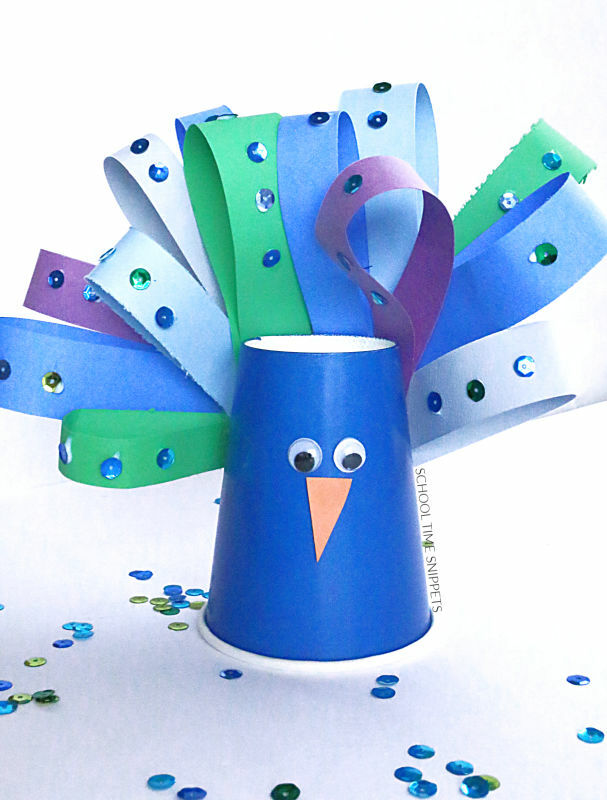 ), at least make this peacock paper cup art and craft! After reading make your own paper cup peacock! For ease, we used a blue paper cup. 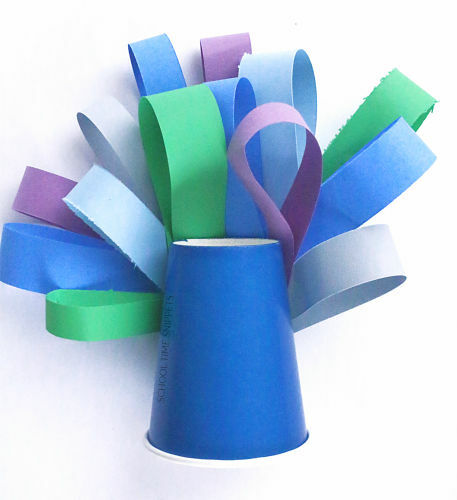 However, if you happen to have white paper cups on hand by all means, use those-- just paint them blue first! Using a paper trimmer, cut strips of paper- blues, purple, greens- about no more than an inch wide. For the beak, cut a small triangle from orange construction paper. To start assembling your peacock craft, take the strips of paper and loop them in half. Staple the ends together. 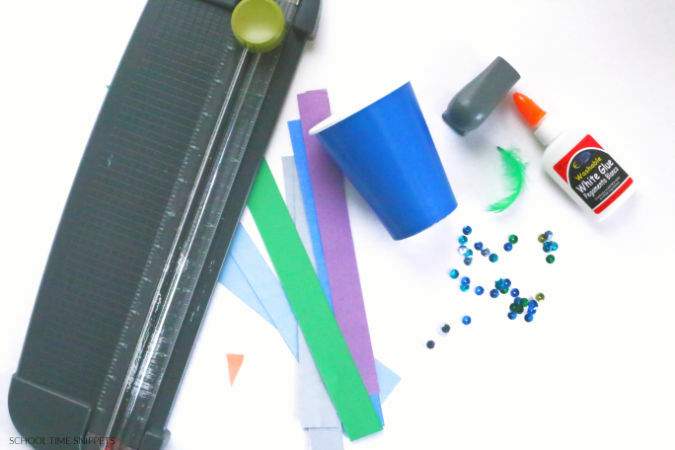 Once you have made several feathers from the colored construction paper, start adhering them to the back of the cup with tape. Tape a few starting at the middle of the cup. Then create another row by taping another set of looped paper "feathers" above the first row. If desired, add a few more paper "feathers" to fill in any gaps. Next add two googly eyes and orange beak to the front of the paper cup. To add some sparkly, glue small sequins onto the paper feathers. If making this craft with little ones, tiny sequins such as the ones we used may be a bit frustrating. Other ideas would be to use larger sequins, stickers, or have q-tip dipped in sparkly paint! Finally, tape a feather to the top of the paper cup. So stunning and simple was this peacock art and craft! 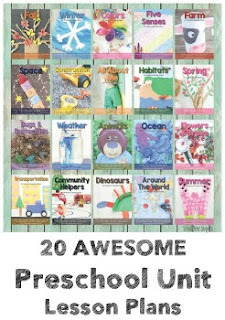 We hope you enjoy it during your next Storytime and craft session!! 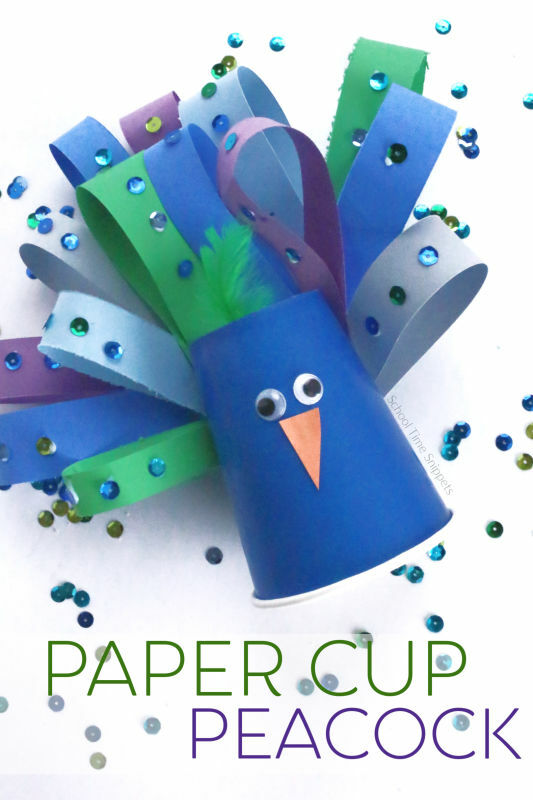 because who wouldn't want to create one's very own Peacock Paper Cup Craft?! 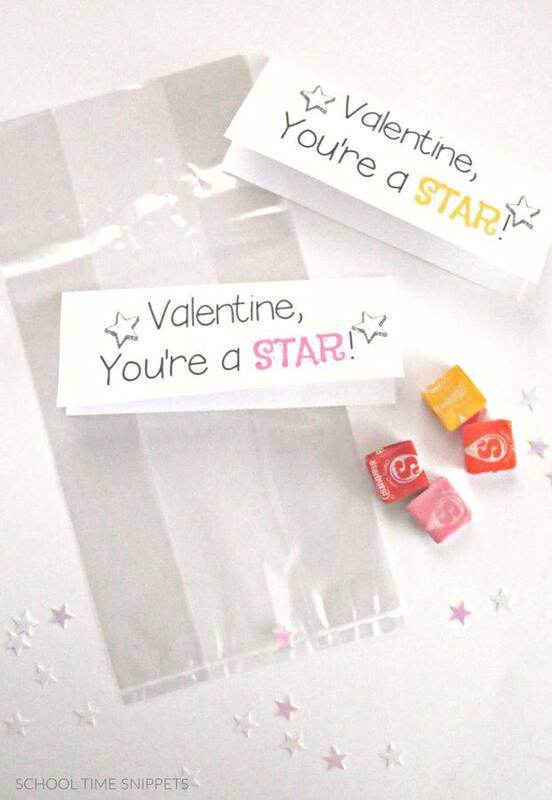 With Valentine's Day upon us, here is a fun and colorful way to practice letter recognition with your little one(s). 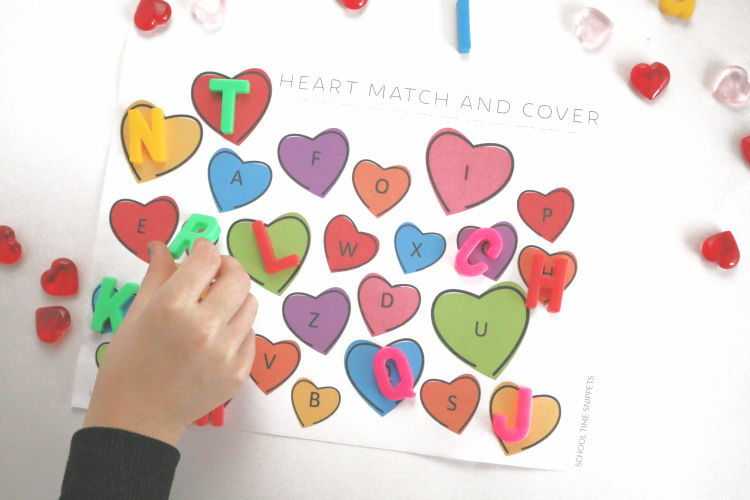 Use this hands-on Valentine Theme Alphabet Matching Game Printable to work on abc recognition with your toddler, preschooler, and/or Kindergartner! 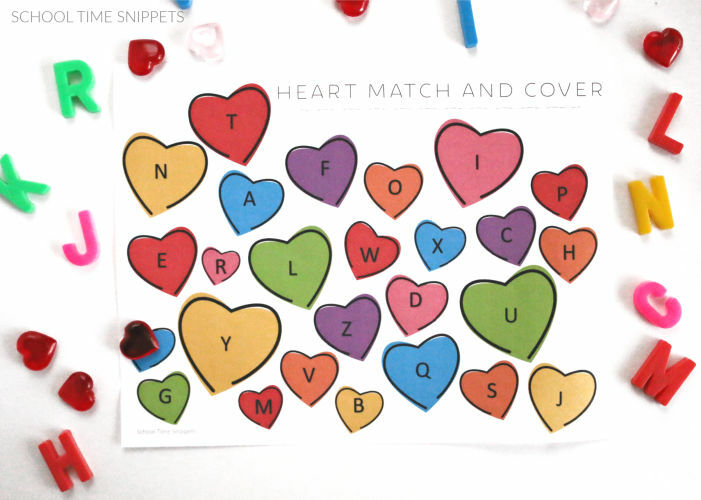 Enjoy this low-prep alphabet matching game printable to use with your other preschool Valentines activities. However, it would be a great one-on-one activity to teach letter recognition with your toddler, too. Or, adjust this alphabet matching game to work on letter sounds and it can be used with Kindergarten kiddos! This versatile alphabet matching game printable is great for hands-on learning! 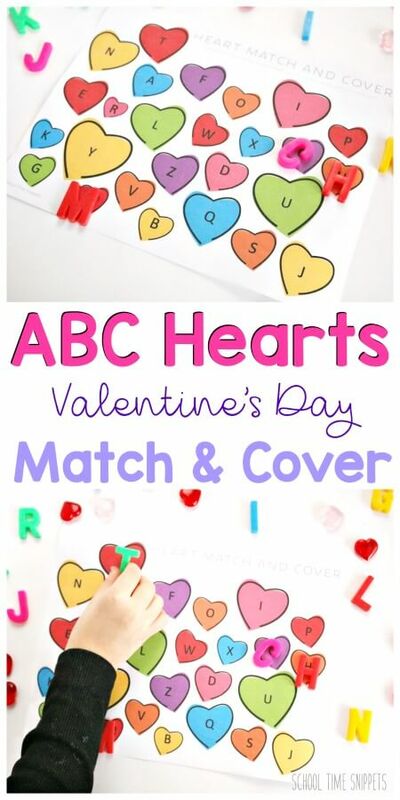 I'm all about setting up easy and quick learning games, so whether you are using this during a Valentine themed week, shapes theme, and/or just because you need a quick abc recognition activity, this is a great way to learn and play today! First, choose and print, the uppercase matching printable or lowercase ABC matching printable. Provide your child with letter manipulatives. 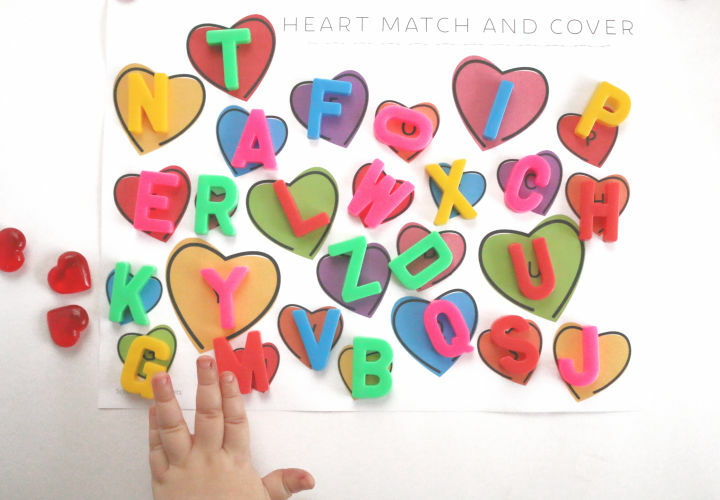 Encourage your child to pick up a letter, identify the name and/or sound of the letter, and then find its match on the Heart Match and Cover Printable. As much as this alphabet matching game printable is low-prep, it's quick to play, too! 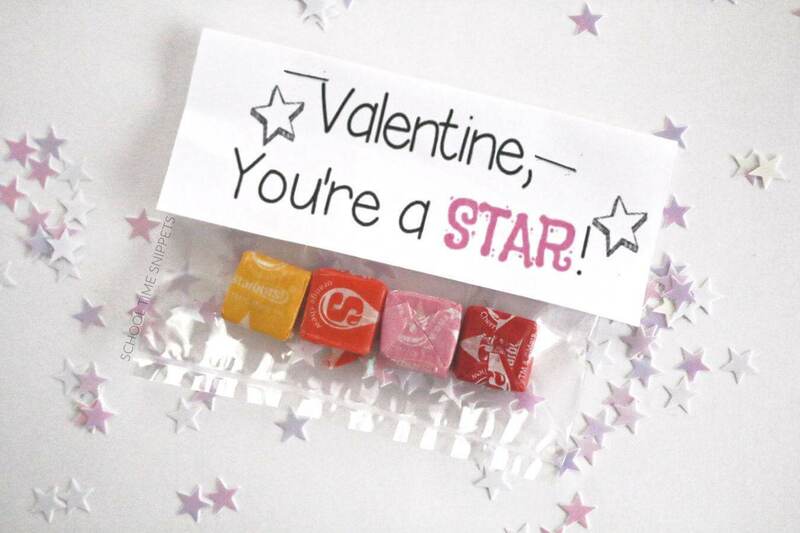 The ease in setting up this valentine's day activity for your preschooler won't take away from the other fun valentine theme activities you may have planned for the day! 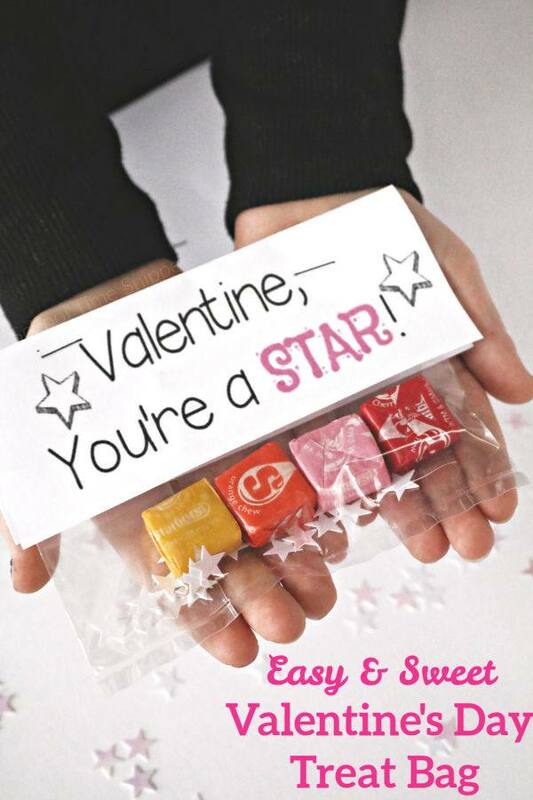 This preschool valentines activity is a great way to learn and play today! To extend learning, once your child has matched all the letter manipulatives on the printable, call out letters to your child and have him/her find the letter and take it off. This is a great way to "clean up" and get extra use out of the printable before putting it away! For an extra sensory experience, hide the letter manipulatives in a simple sensory bin or add fine motor skills practice by having your child unwrap each letter first like we did in this activity. Or, hide the letter manipulatives around the room and have your child go on a little scavenger hunt to find the letters prior to completing the matching game. As you can see there are plenty of ways to take a simple activity such as this Valentine theme alphabet matching game printable and tailor it to meet the needs of your kiddos! personal/ small educational use only. do not alter, copy, sell, host, or upload printable file to be shared with others.